A 22-year-old man is facing multiple charges after allegedly setting more than a dozen cars on fire on a busy street in Edmonton. Police were called to a popular bar and restaurant district on Whyte Avenue around 8:40 p.m. on Friday after receiving reports that a man was pouring gasoline on vehicles and setting them on fire. “He lit all four cars on the east side of 104th, crossed the street and then hit about five or six to this side,” Next Act Pub general manager CJ Rowein told CTV News Edmonton. 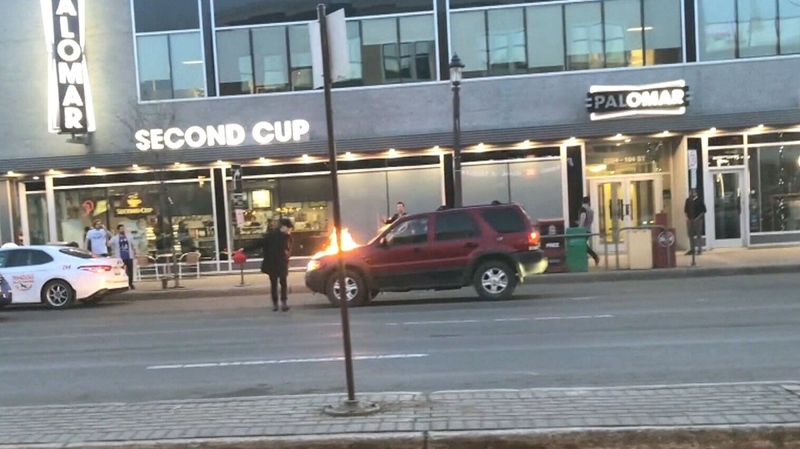 Exclusive video provided to CTV News Edmonton appears to shows the suspect lighting Molotov cocktails behind a local store 15 minutes before the alleged arson spree began. “It looks like, from the video, that he threw his Molotov cocktails and then came back for his jerry can and then continued on his rampage down the avenue,” said business owner Mark Wilson. In video taken by witnesses at the scene, the suspect can be heard saying, “I will not hurt you people,” while carrying a container. The suspect, identified by police as 22-year-old Malice Sutton, was taken down by two bystanders before being taken into custody by police. Police say no injuries were reported during the incident, but 13 vehicles were damaged. Sutton has been charged with 11 counts of arson causing damage, three counts of arson with disregard for human life, four counts of possessing incendiary material and one count of assault with a weapon.